Enjoy a tasty beverage and good conversation using this Malibu Outdoor Patio 3-Piece Wood Bistro Set is more than perfect! Comes in a beautiful natural wood Finish, this balcony-height set is perfect for an apartment, condo or houses with small outdoor living spaces. Made from Eucalyptus Hardwood, this set is extremely competent at combating insect attacks and decay as well. Relax in style with this comfortable bistro table set from CorLiving. The sleek lines and powder coated aluminum frame create an elegant look, while the wide slat table top provides the ideal surface for dining. The table top and barstool seats are constructed from a durable engineered polymer material, giving it the appearance of painted wood without the necessary upkeep and is UV resistant which prevents discoloration. This set is expertly constructed to withstand a range of climates. Whether for a small bistro, coffee shop patio or stylish condo balcony, our Festival set is a perfect fit. The aluminum construction means no rust and the electrostatically applied powder coated finish feature a curved mesh back rest for added comfort and also stacks for compact storage. The table top also has a folding top feature so they store compactly as well. Small space, no problem, as Festival adds style, colour and design to any setting. The set includes 2 stacking arm chairs and a 24 inch round table. Malibu 3-Piece Outdoor Wooden Patio Bistro Set Enjoy a tasty beverage and good conversation using this Malibu Outdoor Patio 3-Piece Wood Bistro Set is more than perfect! Comes in a beautiful natural wood Finish, this balcony-height set is perfect for an apartment, condo or houses with small outdoor living spaces. Made from Eucalyptus Hardwood, this set is extremely competent at combating insect attacks and decay as well. 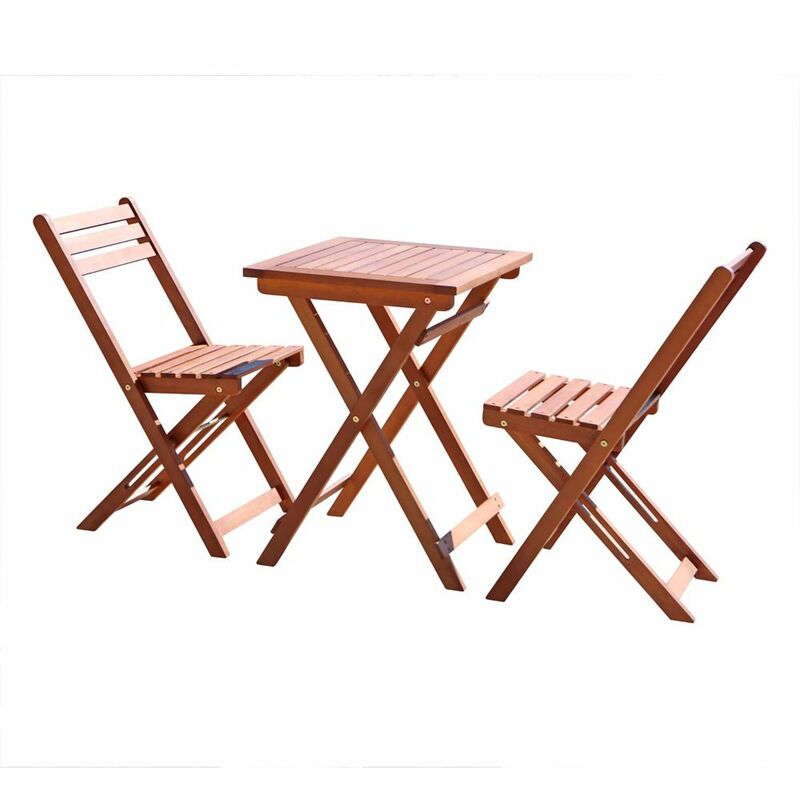 Malibu 3-Piece Outdoor Wooden Patio Bistro Set is rated 5.0 out of 5 by 2. Rated 5 out of 5 by John from Great selection Does exactly as advertised good quality and price. Rated 5 out of 5 by TexasMom from Loved it, absolutely fit what we needed and wanted Great bistro set. Gave it to my son for the balcony at his apartment. It fit perfectly and since it folds up, it can easily be put away when he is gone or there are heavy winds.